The many-faceted career of cellist Yo-Yo Ma is testament to his continual search for new ways to communicate with audiences and to his personal desire for artistic growth and renewal. Mr. Ma maintains a balance between his engagements as soloist with orchestras worldwide and his recital and chamber music activities. His discography includes over 90 albums, including 18 Grammy award winners. Mr. Ma serves as the Artistic Director of Silkroad, an organization he founded to promote cross-cultural performance and collaborations at the edge where education, business, and the arts come together to transform the world. More than 80 works have been commissioned specifically for the Silk Road Ensemble, which tours annually. Mr. Ma also serves as the Judson and Joyce Green Creative Consultant to the Chicago Symphony Orchestra’s Negaunee Music Institute. His work focuses on the transformative power music can have in individuals’ lives, and on increasing the number and variety of opportunities audiences have to experience music in their communities. Mr. Ma was born in Paris to Chinese parents who later moved the family to New York. 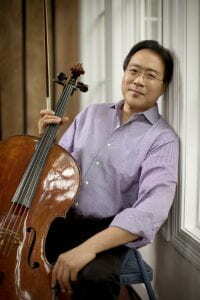 He began to study cello at the age of four, attended the Juilliard School and in 1976 graduated from Harvard University. He has received numerous awards, among them the Avery Fisher Prize (1978), the National Medal of Arts (2001), and the Presidential Medal of Freedom (2010). In 2011; Mr. Ma was recognized as a Kennedy Center Honoree. Most recently, Mr. Ma has joined the Aspen Institute Board of Trustees. He has performed for eight American presidents, most recently at the invitation of President Obama on the occasion of the 56th Inaugural Ceremony. For additional information, see: www.yo-yoma.com, www.silkroadproject.org, and www.opus3artists.com.